Morial, who was recently appointed as a member of the President’s Advisory Council on Financial Capability for Young Americans, talked with BlackGivesBack.com (BGB) about the National Urban League’s work to help African-Americans access jobs in communities across the United States. This work is being made possible through funding from the Walmart Foundation, which is part of a total of $1.75 million the Foundation is donating to three leading nonprofit organizations to help African-Americans access higher education and job opportunities this year. “Since 2006, we have been able to increasingly grow our workforce training program through ongoing support from the Walmart Foundation and subsequently have exceeded expectations of the number of individuals we’ve been able to serve,” said Morial. Read on to learn how the National Urban League is addressing unemployment among African-Americans and what you can do to get involved. BGB: What are the significant unemployment challenges facing African-Americans? Morial: The black community faces the problem of unemployment, high joblessness (12 percent of the Black community is without work according to statistics), and underemployment, meaning people who are working but they are in part-time jobs and they’d like to work in full-time jobs, or they’re working as cashiers and they’re qualified to be teachers, or nurses or administrative professionals. These problems have been made worse by the great recession. It has forced these numbers upward and they’ve not significantly come down. How is the National Urban League addressing this? The way we’re addressing this is through our broad initiative announced last year called Jobs Rebuild America. We’ve committed 100-million dollars over the next five years to increasing our job training, job placement, after school programs and entrepreneurship programs. We’re working in approximately 50 cities for a number of these initiatives, and it is our way of trying to connect people to work. For historical purposes, the National Urban League in the last 5 years has been providing workforce services to over 1 million people through our website, through job developers at our sites who provide job placement, job training programs and job fairs. We also provide entrepreneurship services; we’ve got 11 entrepreneurship centers across the nation. These centers are one-stop business assistance shops for entrepreneurs. On an annual basis we serve about 12,000 people who fit into that programmatic model. We run after school programming in almost 40 cities across the nation through Project Ready, which is a middle and high school after school leadership development program that strives to prepare young people to finish high school and go to college. We have a wide range of things that we do and this is our commitment – we are a “do” tank, not a “talk” tank. We are a “do” tank, not a “think” tank. We’re not just publishing papers with ideas, we’re engaged in innovative strategies to put people to work. Please share more about the Walmart Foundation’s recent grant of $1M in support of Jobs Rebuild America. Walmart is a supporter of Jobs Rebuild America. Their support is allowing us to strengthen and expand our job training program in a number of cities. They are one of a number of private sector partners who are supporting Jobs Rebuild America. The other partners are the federal government–the Department of Labor, the Department of Justice and the Department of Housing, among others. 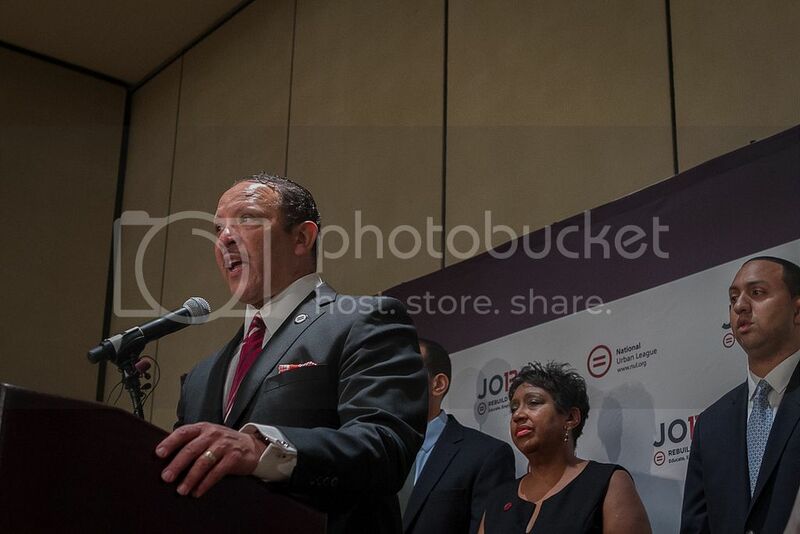 Follow us on Twitter at @MarcMorial and @NatUrbanLeague, visit our website at nul.org and sign up to join our community. Also by visiting our website, click on the “Jobs Network” and connect to the thousands of job listings that we have, and put in your zip code to find an Urban League center near you. The National Urban League (www.nul.org) is an historic civil rights and urban advocacy organization dedicated to economic empowerment in historically underserved urban communities. Founded in 1910 and headquartered in New York City, the National Urban League has improved the lives of tens of millions of people nationwide through direct service programs that are implemented locally by its 95 Urban League affiliates in 36 states and the District of Columbia. The organization also conducts public policy research and advocacy activities from its D.C.-based Washington bureau. The National Urban League, a BBB-accredited organization, has a 4-star rating from Charity Navigator, placing it in the top 10 percent of all U.S. charities for adhering to good governance, fiscal responsibility and other best practices. Walmart and the Walmart Foundation are committed to helping people live better through philanthropic efforts. By operating globally and giving back locally, Walmart is uniquely positioned to address the needs of the communities it serves and make a significant social impact within its core areas of giving: Hunger Relief & Healthy Eating, Sustainability, Career Opportunity and Women’s Economic Empowerment. To learn more about Walmart’s giving, visit foundation.walmart.com.